Context and history visualization plays an important role in visual data mining especially in the visual exploration of large and complex data sets. The preservation of context and history information in the visualization can improve user comprehension of the exploration process as well as enhance the reusability of mining techniques and parameters to archive the desired results. 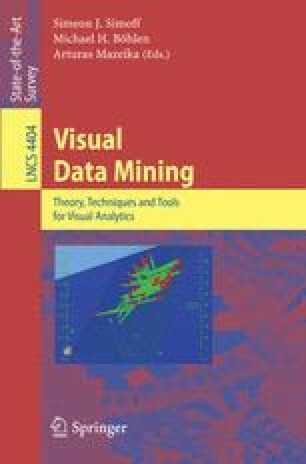 This chapter presents methodology and various interactive visualization techniques supporting visual data mining in general as well as for visual preservation of context and history information. Algorithms are also described in supporting such methodology for visual data mining in real time.